Mildly sweet golden fried bread served with thickened milk (rabri) or cream garnished with crunchy dry fruits- the description itself sounds delicious. This uncomplicated sweet called Shahi Tukda is a kind of Indian bread pudding that no child or adult can resist. The recipe is similar to Double ka Meetha, a hyderabadi sweet. The major difference being shahi tukda has crisp and crunchy bread slices and double ka meetha has them soft and gooey. Stale bread works best with this recipe but if you cant manage it, keep the bread for a few hours in the refrigerator and then use it. You can also pan fry or toast the bread instead of deep frying it. Specially if you want the fat content in the dish reduced. Just make sure that the bread is golden brown and crunchy. Dissolve sugar in 2 cups of water over medium heat and let it boil for about 10 minutes. You can do this while the bread slices are being fried. Garnish with thinly sliced almonds and pistachios and refrigerate. 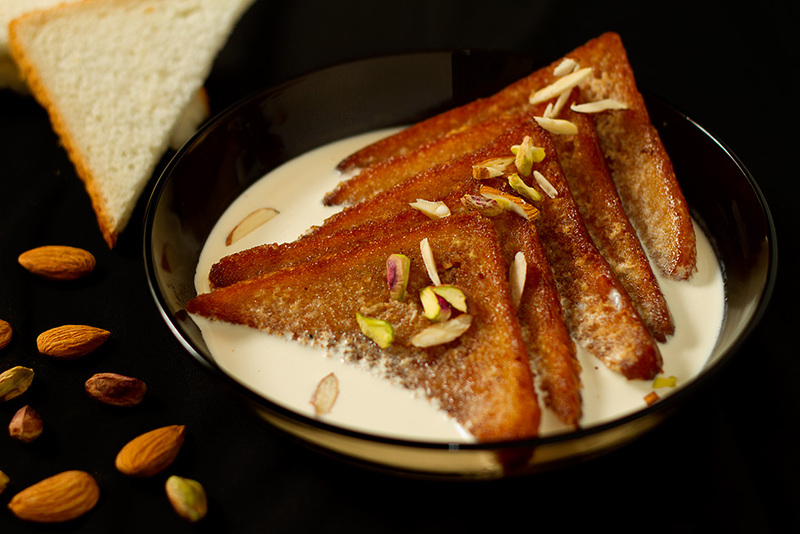 Serve Shahi Tukda as a dessert after a dinner of any mughlai cuisine to complete the spread. This dish is best served cold.